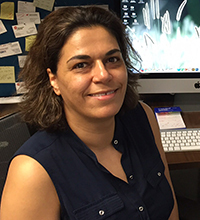 Mojgan Naghavi, PhD, associate professor of Microbiology-Immunology, was senior author on the study published in Nature Communications. For the first time, scientists have identified and inhibited a molecular process that can lead to neurodegeneration in patients with HIV, according to a Northwestern Medicine study published in Nature Communications. Mojgan Naghavi, PhD, associate professor of Microbiology-Immunology, was senior author on the study, and Qingqing Chai, PhD, a postdoctoral fellow in Naghavi’s lab, was the lead author. Previous studies have found elevated levels of toxic beta-amyloid protein in the brains of patients with human immunodeficiency virus (HIV), causing HIV-associated neurocognitive disorder (HAND). While combination antiretroviral therapy can greatly slow down HIV progression, up to 50 percent of these patients exhibit milder forms of HAND. Buildup of beta-amyloid is thought to be a major contributor to neurodegeneration in a variety of dementia-associated diseases, especially Alzheimer’s, but how and why beta-amyloid is produced in HIV-infected patients and its contribution to HAND was a mystery, Naghavi said. The first clue came when Naghavi and her colleagues preformed a large-scale assay looking for unusual interactions between cellular proteins and Gag, an important HIV protein. A number of proteins were shown to bind with Gag, but one stood out — membrane-associated amyloid precursor protein (APP), a protein that can be processed to produce the toxic beta-amyloid protein. “We put two and two together: We knew APP is a precursor to beta-amyloid, so we looked for APP and found increased processing of this protein into beta-amyloid in infected macrophages and microglia,” Naghavi said. Macrophages and microglia are two types of non-neuronal brain cells that HIV infect, often functioning as reservoirs of the disease in the brain, according to Naghavi. In those cells, APP interferes with HIV infection, and in response, HIV tries to circumvent that barrier. The interaction between APP (red) and GAG (green) in the cell. During infection of a microglia or macrophage cell, HIV’s Gag protein promotes processing of APP, reducing resistance to cell takeover, which also has the side-effect of producing toxic beta-amyloid proteins, Naghavi said. To reduce buildup of beta-amyloid, the scientists targeted the enzyme that cleaves APP, called gamma secretase. A simple inhibitor that blocked APP processing produced dual benefits by inhibiting infection and reducing beta-amyloid production, according to Naghavi. When the drug blocks APP processing, it reduces beta amyloid and increases APP compared to non-drugged models. This results in the combined benefits of reduced neurodegeneration and sustaining APP’s original function of blocking infection. However, translating these findings into a drug that works in patients is still a ways off. Compounds that have the intended effect may also be toxic in humans or have other undesirable side effects, so finding non-toxic drugs that can modulate gamma-secretase is the next step towards an actionable treatment. HIV patients are living longer thanks to more effective treatments, so there’s a growing need to address the HIV-specific chronic health issues they encounter as they age, said Naghavi. This study was supported by National Institute of Health (NIH) grant P01GM105536 and grant R01GM101975, P01GM105536 and R01NS099064 and with help from the Third Coast Center for AIDS Research (CFAR), an NIH funded center (P30AI117943).